Henry Williams have been supplying drop and upset forged DBB valves for over 10 years and hold supply framework agreements with a number of the major producers in the instrumentation valve forgings sector. 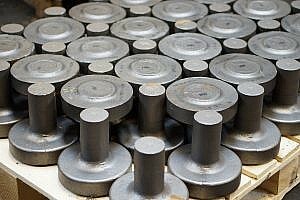 Our Single Flange forgings are unique within the UK and are produced on our large 8" upsetter. They do not require proof machining before finished machining unlike drop or open die forged products. The zero draft and high concentricity offered are perfectly suited to high speed CNC production. This method of manufacture also gives zero forging scrap and offer excellent value for money. We can manufacture to your exact drawing requirements in any grade of Carbon, Stainless Steels or Alloys. We have a number of house dies and now carry stock forgings in the Flange Screw geometrys listed below, in A350 LF2 and 316L Stainless Steel. These are available on a next day delivery within the UK and an express service (3 days) within Western Europe; there is no minimum order quantity. We also hold F51 Duplex in raw material form for short leadtime conversion (typically 3 weeks); all F51 is covered under our NORSOK M650 approval scope. 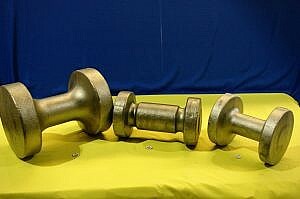 The Flange by Flange forgings are available from ex stock material again on a 3 week leadtime. All our forgings come tested to the relevant ASTM standard by our UKAS approved mechanical testing laboratory and can be tested to your specifications including 3.2 certification as required.